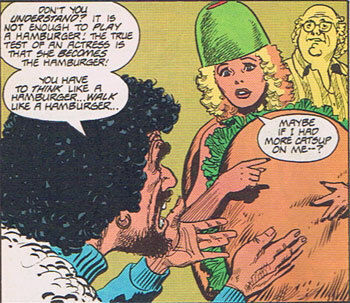 Random Panel: Wait, burgers don't have olives, so what's that on her head … ? 7 Responses to Random Panel: Wait, burgers don't have olives, so what's that on her head … ? Hmmm, more ketchup on her she says? I’d like to say something dirty, but I don’t like ketchup, so I’ll leave the dirty stuff to another responder. I’ve always held a dim view of people who use the word “catsup.” Almost as bad the misuse of “alot” to mean “a lot,” but I digress. You just can’t find good acting people these days… What kind of broadway reject can’t walk like a hamburger? By the by, John, I happen to like alot of catsup on my burgers. Okay… coming from a country that doesn’t have quite such an open commercial market place, can someone tell me the practical difference (if any) between catsup, ketchup and tomato sauce? As far as I can tell, catsup and ketchup are just two different spellings for the same thing. Tomato sauce, however, has very little (if any) added sugar, is not as thick, and is not used as a condiment — it’s a base for making pasta sauces and other such dishes. Ketchup is very sweet and reasonably thick. It’s like condensed tomato sauce with lots of sugar and other chemicals added in.